Cherry Growers of Australia represent the biosecurity interests of cherry growers and the industry. In 2015–16, production of cherries was valued at $158 million (LVP). The cherry industry comprises 485 cherry enterprises farming 2,845 hectares and producing more than 18,500 tonnes of fruit. Australia produces some of the world’s finest cherries. Growing international demand is driving expansion, with new investment within the Australian cherry industry from both local and overseas stakeholders. Currently, 70 per cent of produce is for domestic consumption, with $76 million of Australian cherries exported in 2015–16 to more than 30 overseas markets. Across Australia, cherry growing regions span a variety of climatic zones, with over 30 cherry varieties under production. Cherry growing enterprises vary from smaller boutique orchards in WA and Queensland to larger suppliers in NSW, Victoria and Tasmania who export across the globe. Cherry (Prunus avium) flowers have a single pistil surrounded by about 30 stamen and five petals. 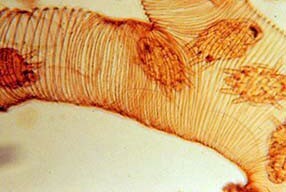 The ovary contains two ovules. 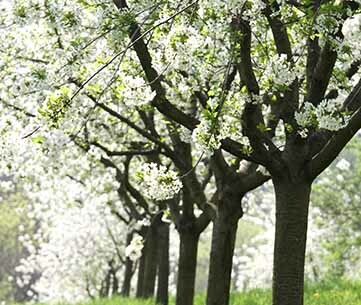 Flowers that are not pollinated soon fall off the tree. Although the flowers may stay open for up to 5 days, the stigma receptivity of some flowers begins to decline as the flower opens. It has been reported that the earliest flowers that open will produce the highest quality fruit. Most cherry cultivars are self-incompatible. Pollination occurs by insects, with honey bees the most important. A study in Victoria demonstrated the importance of honey bees as the primary agent for pollinating cherries. Trees caged from bees had a 2 per cent fruit set, as compared to uncaged trees exposed to the activities of honey bees which had a 35.9 per cent fruit set. The yields were 1.9kg/tree for the caged trees and 35.2kg/tree for the uncaged trees. It was also observed that 97 per cent of the insects that visited the cherry flowers were honey bees. 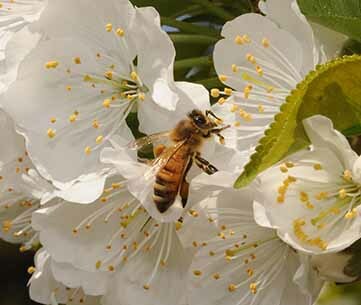 Honey bees find cherry flower very attractive because they are able to collect both nectar and pollen. Pollen foragers are likely to be the better foragers as they usually have more pollen on their bodies. They normally enter cherry flowers by climbing though the anthers and so even nectar gatherers have good stigma contact. Whether the extra pollen carried will increase pollination significantly is unknown. Feeding sugar syrup to colonies has been shown to increase cherry pollen collection and may increase pollination, as it should increase the total number of bees visiting the crop, as it does for other crops such as kiwifruit. 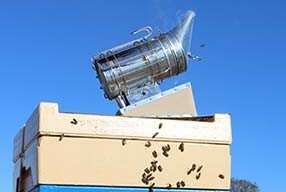 Although 2–3 hives per ha are usually used for cherry pollination, it is recommended that up to 10 honey bee colonies per hectare be introduced for effective pollination.